When we were first dating, Mel had to go to London for two weeks for work. Upon his return, half his suitcase was crammed with shortbread and chocolate. I blame him for the “first year 15” I gained after we got together. Really, I have NO. Control.When it comes to shortbread. One box of the stuff is gone in a flash. My favorite shortbread is Walker’s brand. You know, the red plaid box? I remember getting it as a kid somewhere, a small pack of them, and savoring each buttery bite. You’ll imagine my delight when the nice folks at Walkers US contacted me about trying Duchy Originals all-natural shortbread, one of the brands of delightfulness they make. I mean, shortbread? For me? To make crust with? Seriously, it’s like that trip to London all over again, and I’m already up the “first year 45.” I’m not sure how much more I can take! 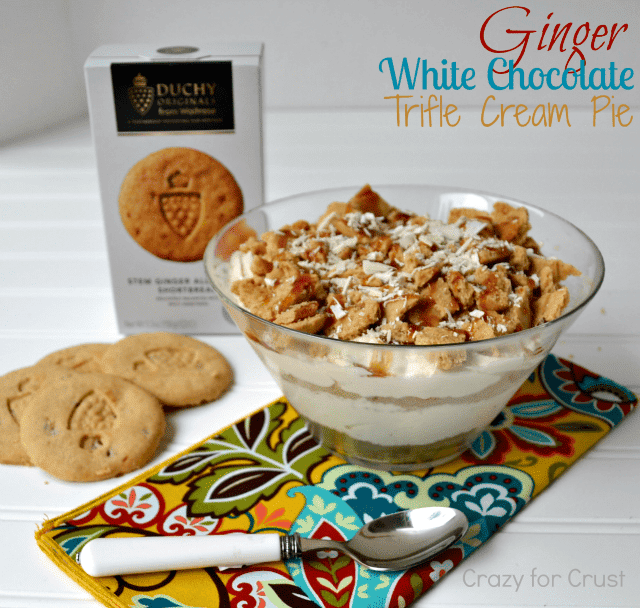 Duchy Originals has several flavors, including original all-butter, lemon, and stem ginger. The stem ginger cookies were the ones that intrigued me the most. I mean original and lemon are freakin’ awesome, don’t get me wrong. But if you shout shortbread or lemon shortbread in a crowded room of dessert bloggers, you’ll get 100 answers of what to make in about .34 seconds flat. But, yell stem ginger and people might look at you funny. When I hear “ginger” I automatically think of houses and royal icing. These are not that. These are a delightfully butter shortbread cookie infused with chewy, spicy, ginger pieces. I kinda, really, wish I had them when I was preggers. Would have helped waaaaay better than saltines. To me, when I think of ginger…I also thing of white chocolate. And cheesecake. The stem ginger gives the perfect spiciness to the sweet cheesecake. I thought about doing a bar…but changed my mind when I was digging through my cabinet and found this supercute trifle bowl I had bought at Ikea ages ago and never used. Instead of a baked pie bar, I made a pie trifle. 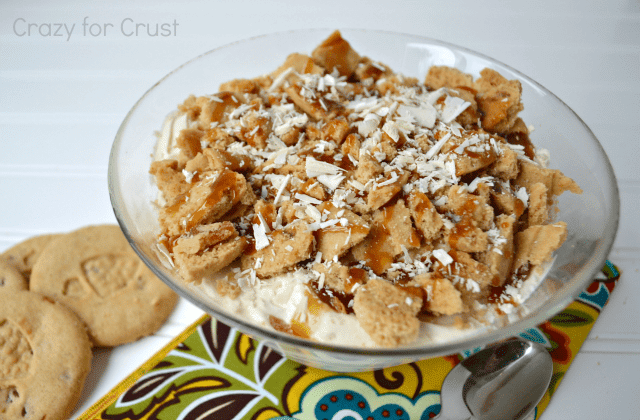 This recipe would be an easy and really good addition to any Holiday party! 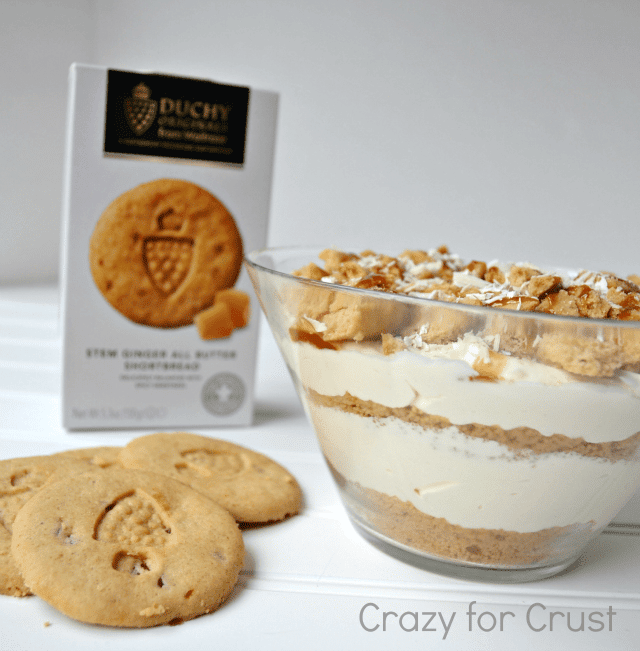 The crust is made of crushed stem ginger Duchy shortbread cookies and it is layered with white chocolate cheesecake (no-bake!) and topped with even more cookies and then some salted caramel sauce. Because caramel goes good with everything. It’s like the little black dress of dessert. And shortbread is the pair of sweet heels that completes the outfit. Melt white chocolate in a microwave-safe bowl on HIGH for about 1-1 1/2 minutes, stirring every 30 seconds. Let cool slightly. In a large bowl, beat cream cheese, powdered sugar, and vanilla with a hand mixer. Beat in slightly cooled white chocolate. Fold in whipped topping. Finely crush 12 cookies (1 box) in a food processor (makes about 1 1/4 cups of crumbs). Place half the cookie crumbs in the bottom of a small trifle dish (you can also use 4 small serving dishes). Press slightly to compact the crumbs, like you would if you were making a pie. Top with half of cream cheese mixture and spread evenly with a spoon. Add the rest of the cookie crumbs and press gently. Spread the rest of the filling evenly over the cookie layer. Coarsely chop remaining 4 cookies. Sprinkle over the top of the trifle. Warm your caramel sauce and decorate the top of the trifle with it. (I put my caramel sauce in a squeeze bottle and squeezed a pattern over the top. You can also use a ziploc bag if you don’t have a squeeze bottle.) Grate 1/2 ounce of white chocolate using a box grater and sprinkle over caramel. Store in refrigerator. This is best eaten same day, as the cookies will soften. You can find Duchy Originals on the Walkers US site. Walkers sent me several boxes to eat and bake with and review. All opinions of the product are 100% my own! This post may be linked to: Chef in Training, Trick or Treat Tuesday, Cast Party Wednesday, Sweet Treats Thursday, Chic-and-Crafty, Tastetastic Thursday, Sweet Tooth Friday, I’m Lovin’ it Fridays, Sweets for a Saturday, A Well-Seasoned Life, Strut your Stuff Saturday, Weekend Wrap Up Party, Weekend Potluck, Sundae Scoop Link Party, and all of these too! I love ginger/molasses or spice-based cookies and paired with the white chocolate, I bet this is just divine, Dorothy! We must be related … shortbread is the best!!! Oh frikk, this looks amazing. I do kind of just want to stuff my face in that bowl.